TPLO is a very intensive procedure requiring exact precision to treat the cranial cruciate ligament deficiency. Dr.Sran has been performing this procedure as an orthopedic surgeon since 2003 with excellent results. We accept the referrals from other veterinarians across BC, Canada and Washington (WA) state, USA. The waiting period is only 1-2 weeks. Patients are sent home on the 2nd day after the surgery. Follow-ups are usually done at the referring hospitals. What is a Ruptured cranial ligament? The cranial cruciate ligament (CCL) is a structure in your dog’s knee joint, that helps prevent excessive motion between the femur (thigh bone) and the tibia (shin bone). The CCL may become injured, either from trauma or due to a dog’s natural leg conformation, resulting in a sudden or gradual tear of the ligament. A torn CCL causes the knee joint to be unstable, resulting in joint pain, inflammation and hind leg lameness. This initiates the development of arthritis and may damage another structure in the knee called meniscus. Can medication be used to treat a ruptured CCL? Anti-inflammatory medications prescribed by your veterinarian may help to decrease the pain and inflammation in the knee joint. Strict cage rest and exercise restriction may allow your dog’s body to lay down scar tissue, in an effort to increase the stability of the knee. However, small breed dogs (under 4 kg) are typically more responsive to medical management of a ruptured CCL. For medium to large breed with ruptured CCL, especially active dogs or those with other orthopedic problems, surgical treatment is recommended. TPLO is a surgical procedure used to treat dogs with ruptured CCL. Developed by the late Dr. Barclay Slocum, the TPLO procedure may be performed by veterinary surgeons who have completed the TPLO training course. The procedure is based on the fact that the top part of the tibia bones normally sloped, resulting in a tendency for the femur to slide back when the dog stands and puts weight on its knee. The CCL normally holds the femur in place and prevents this motion. But when the CCL has ruptured, the femur can slide back and forth along the sloped tibia, when the dog is standing or walking. The continued motion contributes to pain and degeneration in the knee joint. A solution to the knee joint instability would be to either replace the torn CCL or remove the slope in the tibia. The TPLO does the latter: after making a cut in the top part of the tibia, the surgeon rotates this segment of the bone until it is almost perpendicular to the ground. To allow the cut bone segments to heal, the tibia is then stabilized with a bone plate and screws. The result is that when your dog stands on its leg, the femur is resting on a flat tibia surface, and there is no longer the sliding motion in the knee. Can any size of the dog have the TPLO surgery? The TPLO is recommended for medium to large or giant breeds of dogs and is limited by the size of the TPLO bone plate. Most dogs greater than 15 Kg in body weight would be eligible for a TPLO. What is the hospital stay with the TPLO procedure and what follow-up visits are needed? Dogs are usually discharged next day in the afternoon from the Allwest Animal Hospital following the surgery. Follow-up appointments are usually scheduled at the referring hospital or at our hospital 1 week later for recheck and bandage removal, 2 weeks for recheck and skin suture removal, and in 6 weeks and 10 weeks for radiographs. Your dog may also need weekly Cartrophen shots for 5 weeks post-op. What is the expected outcome for my dog? Dogs who have had TPLO surgery are typically bearing some weight on their operated leg within 3 to 5 days following surgery. Your dog will need to have his or her exercise specifically restricted while the bone is healing, usually for 8 to 12 weeks. Physical therapy, as well as gradual increase in on-lease activity, will be permitted, according to how your dog is recovering. 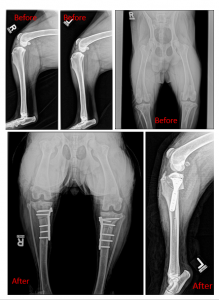 In general, the TPLO procedure for dogs with CCL rupture is associated with a very good early return to leg use: and some research suggests that there is less leg muscle loss and slower progression of knee arthritis following this procedure. What is the approximate cost of TPLO surgery? It depends on few factors like breed, weight, and age of the dog, if x-rays & blood test are done or not, how old is the damage etc. Call-604-870-9333 or email- info@allwestvet.ca for a proper estimate for your dog. How to decide which procedure is best suited for my dog? TPLO procedure is not for every cranial cruciate deficient dog but the decision is made individually considering the following factors. Keep the bandage clean and dry, and check your dog’s toes twice daily for swelling or irritation.You may remove the bandage at home in three days or sooner if it becomes soiled, wet or is bothering your dog. When the bandage is off and until the sutures are removed you should inspect the incision twice daily for signs of redness, swelling or increased pain.Contact us if any of these signs occur. Please contact us for an appointment to have the skin sutures removed in 14 days following surgery. For 10-12 weeks following surgery, you must restrict your dog’s activity to permit normal healing.During this period the dog’s activities will be gradually increased to build muscle, stretch scar tissue and strengthen bone. For the first four weeks after surgery, restrict your dog to slow walks both inside and outside the house.Running, Jumping or rough-house play should not be allowed. Be careful on slippery surfaces so your dog doesn’t slip or fall. Begin with a five minute walk, once a day, with the dog on a short lead, at the “heel” position. If the dog remains comfortable during the first 3-4 days, double the number of walks. The dog will benefit more from two, five minutes walk than a single ten minutes walk. If your dog remains comfortable and seems interested in more activity, continue double the distance, duration or frequency of the walks every 3-4 days. If the dog seems uncomfortable after a walk, reduce the distance to the level at which it was comfortable. After 3-4 days, try to double the distance. After four weeks, you can begin walking your dog on a long (10-15 foot) lease. For the first few days on a long lease, cut the duration of your walk in half. Your dog’s trotting back and forth will make-up for your shorter walk. If the dog remains comfortable, the length or frequency of walks can be doubled every 3-4 days. 6-8 weeks after surgery, we would like to see your dog back at Allwest Animal Hospital for a recheck and radiographs to evaluate healing of the surgery site. If healing is progressing normally, you may start to exercise your dog off the lease. Off the lease activity should occur only after your normal long-lease walk and under your supervision. As with the lease walks, you should start with 5 minutes off lease and double the time every 3-4 days as long as your dog is comfortable. Jumping or free running with other animals or after toys should not be permitted. 10-12 weeks after surgery, A final examination with radiographs will be needed to evaluate final healing. Instructions will then be given for returning your pet to normal activity. This form is provided for the referring veterinarians.Please take a moment to complete and fax this form when you refer a case to Allwest Animal Hospital. The information provided will help our veterinarians to better serve your clients. Please fill up a referral form and fax it or send on line to us. We will contact you/client within 24 hours to setup an appointment. This form is provided for the pet owners. Please take a moment to complete and fax/email this form to get a quote or to book an appointment. The information provided will help us to give you a proper estimate for the surgery and the follow-up. We will contact you within 24 hours to provide an estimate or setup an appointment.